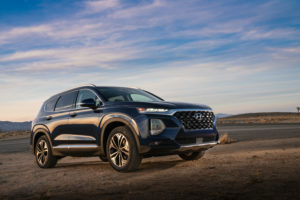 Hyundai’s SUV lineup is the midst of a rebirth and growing in all directions from an award-winning new subcompact to the debut of a larger 3-row later this summer. And in the middle is this next-generation 5-passenger Santa Fe doing what Hyundai does best; giving you more for less. It starts with the little Kona, moves up to the compact Tucson and arrives at this midsize Santa Fe. You may remember it as the Santa Fe Sport. The bigger 3-row version is now called the Santa Fe XL and then the real big boy, the new Palisade, hits showrooms later on this year. Hyundai’s hands-free tailgate doesn’t require a kick which I like. Just get close enough and it will alert you that it’s about to open. Once inside, there are 2 underfloor storage areas that are quite large and switches that remotely drop the rear seats to create a truly flat load floor. Luggage room seems to be sized just right, with a little more volume than before when it’s fully opened up like this. Those in the front will also experience much greater legroom. And ergonomically Hyundai has strategically moved switchgear and redesigned storage areas to create a cabin that juts works better with excellent all around visibility. That’s made even better here with a 360 degree camera with an easy access switch. If only all manufacturers would engineer their infotainment systems to be this intuitive. Hyundai has long since offered one of the best setups and this latest version continues to be both easy to use and chock filmic feature. Twelve speakers with an 11-channel amplifier including technology that cleans up compressed music leads to an incredible surround sound system. Android Auto and Apple CarPlay are here, wireless charging, plenty of USB ports…and this is a system that allows you to immediately get right up to speed. It’s about as good as it gets. For just under $40k this Ultimate 2.0T AWD trim seems like a bargain. Content level is exceptionally high at this price point. The heads up display is one of the best on the market and uniquely includes blind spot information…something most don’t. Usability is very straightforward, displays are modern and it drives with a purpose – quick and comfortable. And despite the hard plastics the dash design exudes a premium feel as do the seats and the textured speaker grilles. Some of the plastics and switches are one rung down from where they should be in an Ultimate model, otherwise the modern design and cool color choices make a very positive impression. Safety features are very high as well including Hyundai’s debut of Rear Occupant Alert – a 2 stage system that helps prevent children and pets from being inadvertently left in a locked vehicle. The Santa Fe also debuts Safe Exit Assist which prevents the rear doors from being opened if it detects a car approaching from the rear. This feature is standard on all Santa Fes as is high beam assist, and smart cruise control with stop and go among many others to really ratchet up the value factor. The more distinctive design, expressive and functional cabin and an appropriately satisfying powertrain – the new Santa Fe is a big time winner at a value price.